Not everyone with a disability can work a job each week. Social Security Disability Insurance (SSDI) offers a certain amount of income a month to people who are suffering from a disability that limits them. However, program administrators are aware of people who use fake or minor disabilities to receive benefits that they do not actually need. This is why the application process is designed to be thorough, with specific requirements that need to be met before a person can qualify. A Philadelphia disability lawyer can help you fill out the application if you are experiencing hold-ups. Back pain is one of the most difficult things to apply for when it comes to disability benefits because back pain is also the most common disability that people apply for. Your application will require evidence that you have been diagnosed with back pain that impairs your usual physical activity. This means obtaining copies of your X-rays, MRIs, or doctor’s notes from your primary physician. Ask your doctor if there are any other copies of medical records that could be used to prove that your back pain limits how much you can do. Back pain is not officially listed under the categories of disabilities, but there are categories that are similar and that may apply to your condition. For example, rheumatoid arthritis is one category that describes inflammation of the spine, which can cause back pain. Choose the category that best fits your current back condition. You will also be required to prove how your back pain limits your ability to hold a job. Have your doctor list out how your condition impairs physical activity, like whether you need a cane or whether you have trouble standing up fully. Degenerative disc disease is a serious medical condition that can cause chronic back pain but is not listed by SSDI. This condition causes the spinal discs to break down until the nerve endings of the spinal cord grow smaller. People with this disease experience pain and musculoskeletal problems that can impair movement. When it comes to figuring out which category to match degenerative disc disease with, many people look for the osteoarthritis and spinal stenosis categories. If your doctor has confirmed that you have developed nerve or spinal cord damage from this disease, then there are other factors that you can provide in your application. These include documentation for nerve root compression, spinal arachnoiditis, or lumbar spinal stenosis. 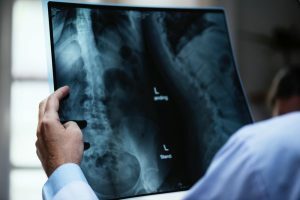 Try talking to a Philadelphia long-term disability attorney if you have been diagnosed with a medical condition that causes back pain or degenerative disc disease. Do not settle for no disability benefits if your application was denied the first time. To find an attorney right for you, call Edelstein & Nelson at (800) 300–0909 for consultation. We have years of experience in helping clients filling out applications for disability benefits, collecting appropriate medical records, and figuring out how you can qualify if your medical condition or disability is not explicitly listed.